May Require VB Run Time Files Download From Microsoft. 1.7 is the final release for 98/ME no more updates will be available. Updated the Switch games list (this is still a work in progress). Important: Updating from v1.0 - 2.0 ? If your updating from 1.0 - 2.0 to 2.1 and you have already made your list be sure to make a back up before updating. 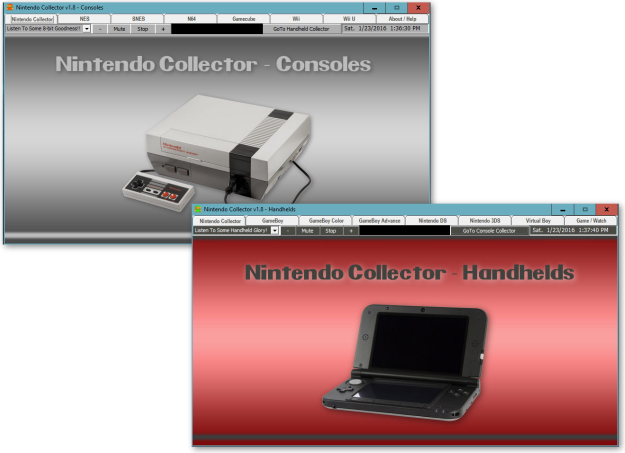 Once your back up has been made uninstall Nintendo Collector 1.x - 2.x. Don't worry it won't uninstall your back up list! After uninstall has been completed then install 2.1 into the same Dir you did previously. If you installed 1.x - 2.x into the default Dir simply do the same with 2.1. Now start the program and restore your back up by clicking on the "Restore Back Up" button. You should see your list! XP/Vista/7/8/10 users will need to import old backups if updating from 1.0 - 1.6 before restoring.